Two things about this pic that make this a very interesting capture. a. This juvenile Sarus Crane is about 4-5 months old and is already a strapping young lad/lass reaching nearly 5-ft in height. 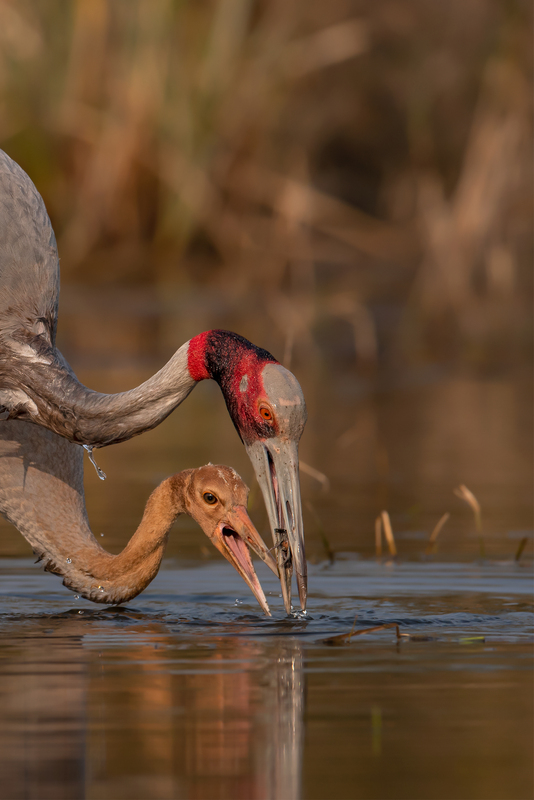 Sarus Cranes are about 6-8 inches at birth, so they must be really growing at a rapid clip during their initial few months. I was mentally visualising a day when the parents had gone out to hunt for food for the juvenile and the rascal would be a couple of inches taller when they returned (“Oh my, haven’t you grown taller” taken to a different level!!) . Wonder how they would be able to identify their young when they are growing so rapidly. b. Just read that in the initial few weeks the parents would search out earthworms, insects and aquatic food for their young and hold them at the level of their beak for the young one to grab them. When the chicks grow up, they would follow a different method of feeding. Instead of holding up the food, they would now dangle it in front of them and drop it to the ground. The chick would need to pick it up from the ground by itself – the first step in the process of self-feeding. What I observed with this youngster was, I believe, an even more advanced step. The juvenile was following the foraging action of the adult with not much success. The adult, however, wasn’t even making an attempt to feed the juvenile. Instead, the juvenile had to be quick enough to steal the prey/food from the beak of the parent. Observed this several times to conclude that this wasn’t accidental but designed to teach the juvenile the next step in self-feeding.